Carey Mulligan as Jeanette Brinson, and Jake Gyllenhaal as Jerry Brinson in Paul Dano’s WILDLIFE. Strong performances from stars Carey Mulligan, Jake Gyllenhaal, and Ed Oxenbould make it a difficult watch, at times. But their work bringing to life complicated emotions and situations also makes it difficult to turn away. It’s a quiet, powerful piece, one that’s sure to leave audiences talking. Oxenbould (“The Visit“) plays Joe Brinson, the 14-year-old only child of Jeanette (Mulligan) and Jerry (Gyllenhaal). When audiences meet them, the Brinsons have just recently moved to small town in 1960’s Montana, and all three are trying to get accustomed to their new lives and surroundings. At first, Joe sees his parents both trying to make the best of things, and he does his part, too. But the strains of moving are too familiar to this family. Though he doesn’t fully understand what’s happening, Joe can see a strain in his parents’ relationship. Things get worse when Joe comes home one day and learns his dad will be leaving. He watches as Jerry and Jeanette fight over his decision to join other men from the town to fight a large and dangerous mountain fire far from home. Then, once Jerry’s gone, Joe watches his mom’s behavior change radically. Suddenly cut adrift from her identity as a “happy” housewife, she struggles with her fear, anger, and desperation. What emerges from the tumult only leaves Joe with more questions that no one has answers for, especially not his parents. “Wildlife” is based on the novel of the same name by author Richard Ford. The adapted screenplay for the film comes from Paul Dano (“Prisoners“, “Swiss Army Man“) and Zoe Kazan (“The Big Sick“). Together, they craft a remarkably nuanced, gentle but fearless story about family. They start with a recognizable archetype of American home life and then deconstruct it in the face of challenges that there are no easy responses to. The result is a very relatable film, full of situations that should resonate emotionally with audiences. After all, what family hasn’t had turbulence? What family hasn’t been faced with an existential challenge that forces everyone to question who they really are and what they really want? The film also serves as Dano’s directing debut. He chooses to have this story play out in front of a Rockwell-esque townscape threatened by fire and smoke. That choice informs the tone of everything that plays out in “Wildlife.” The fire is a clear metaphor — it’s large and dangerous enough to be clearly visible in the distance, but at the same time its far enough away that people can go right on being absorbed with their personal preoccupations. This time out, it’s her ability to project so many tumultuous emotions wrestling within Jeanette at once that’s really impressive. Anguish, confusion, spite, insecurity, rage — she projects them all, fighting to surface from beneath a placid face she puts on for Joe and others. The role demands all that, but at the same time demands relatability. After all, Jeanette’s faced with isn’t a new problem by any means. Just how she reacts to the crisis is unique, and Mulligan makes that uniqueness feel genuine and understandable. 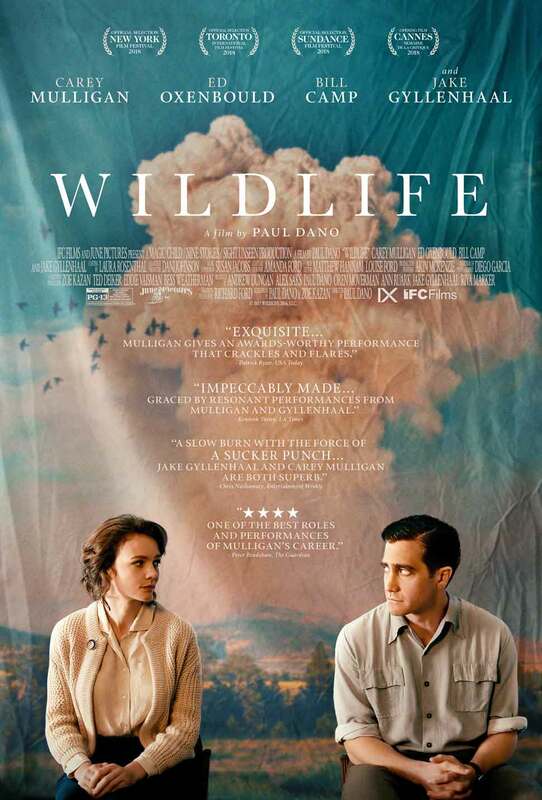 Again, for Mulligan’s work, for its thoughtful script and artful execution, “Wildlife” deserves attention while it is in theaters. It’s a tough watch at times, no doubt. But that difficulty comes from just how well the film brings to life such familiar tribulations. Given a chance, audiences are likely to find it a rewarding, if sobering, viewing experience. Starring Carey Mulligan, Ed Oxenbould, Bill Camp and Jake Gyllenhaal. Directed by Paul Dano. Rated PG-13 for thematic material including a sexual situation, brief strong language, and smoking.